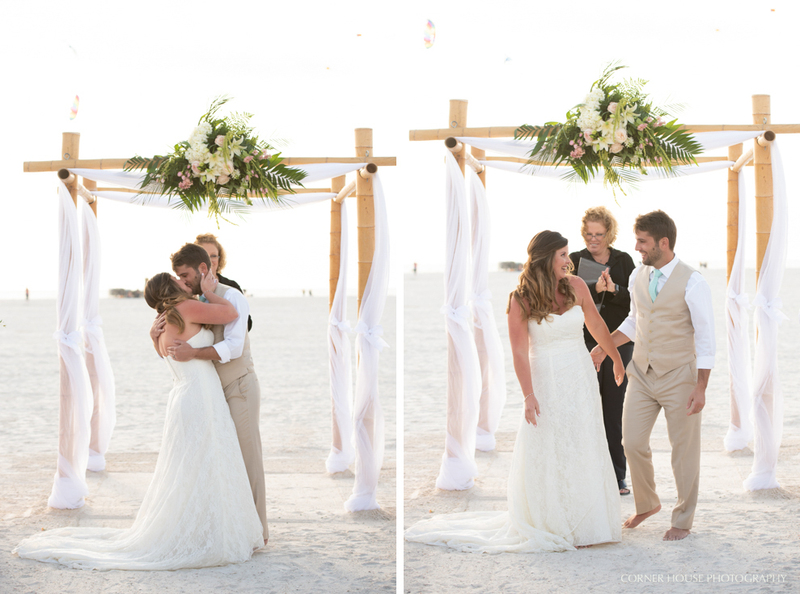 Tiffany and Andrew tied the knot during their Bilmar Beach Resort wedding in Treasure Island, Florida. A vivacious bunch, my sweethearts were in celebration mode from the dawn to dusk. The love could truly be felt throughout their big day! Flashback to November of 2011, the two met by chance after Tiffany’s group of girls were invited over to hang out by one of Andrew’s dorm roomies. Tiffany immediately caught Andrew’s eye, and after chatting it up that night, exchanged numbers and soon dating ensued. 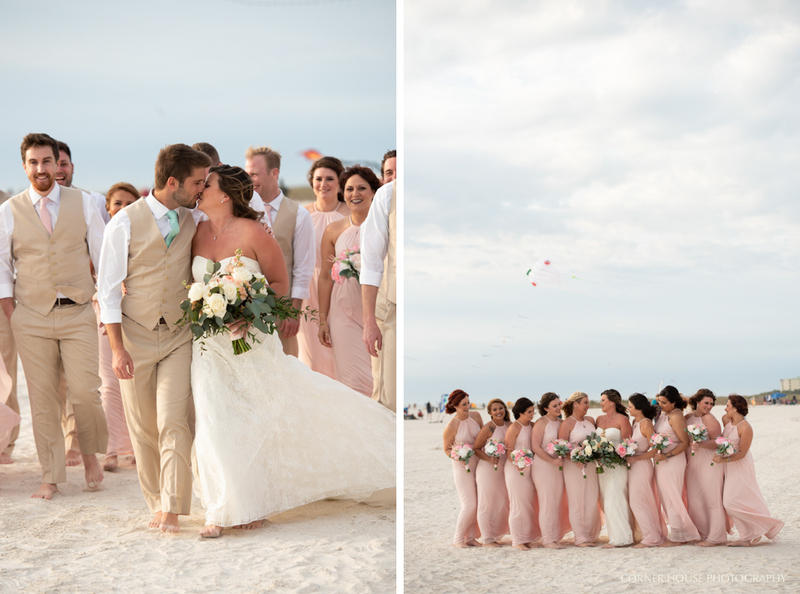 Fast forwarding to their big at the Bilmar Beach Resort in Treasure Island, the two envisioned a day of “fun” filled with dancing, dining, and the love of their family celebrating in their special moment. Arriving a bit early, we were greeted by Tiffany wrapping up hair and makeup. Starting with her details, we dove into adorable robe shots afterwards before heading to the guys who were starting to gather downstairs. While our girls were changing into their dresses, we went on an adventure with Andrew and his guys for a few killer beach shots. I must say that at first the largest kite festival in Florida might scare some when it comes to pictures, but for my team we were enamored by how much fun the backdrop of all of our photos would be. I just knew it would be the perfect opportunity to incorporate a little bit of uniqueness that we may never experience again. After a bunch of silly shots with our guys, cheering and toasting, we headed back to Tiffany for putting on her dress. Of course, after bridal portraits and a few photos with her girls, we just had to bring Tiffany and her group outside where we took Andrew’s photos with his guys among the kites. With getting ready and our bridal party portraits wrapped up, we headed to off to our couple’s oceanside ceremony. Taking place on the beach, it was as though the clouds came perfectly by to diffuse the bright sun. Sharing their “I do’s” and a first kiss, we reveled in the moment of such joy between Tiffany and Andrew. After their ceremony, we stayed put with family and their bridal party for formal portraits, followed by newlywed portraits along the beach. Reception entrances included lively introductions, sentimental toasts (not going to lie, but Andrew’s brother totally killed it on his speech and had the entire wedding party laughing), and special first dances. Before dining began, we stole Tiffany and Andrew away for a quick five minute sunset portrait. Dancing filled the night with tearful goodbyes as we wished our couple an amazing life together!